It is hard to decide which roofs to show, or rather, which roofs not to show, since I enjoy them all. But they are hard to photograph. When I look at a roof with my naked eye, I can see wonderful detail or color, but that often doesn't translate to the picture - if the sun is out, the slate shines, but on a cloudy day, the colors don't show. Photos taken of north sides are best, but some roofs don't face north. Photographing from a distance generally works well, but often trees or houses block my view. So the photos I've selected to post here may change, as I figure out how to take better pictures. The Park-McCullough observatory, built in 1864, now missing its iron cresting. 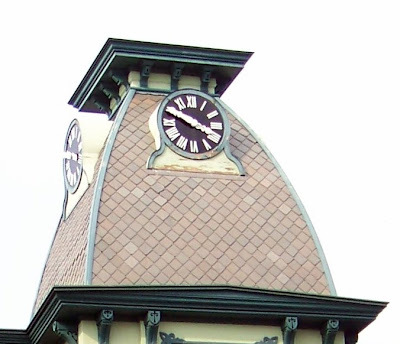 Here's a slate roof that is just roofing, while the wood arches, corbels, and brackets are the high points. The Victorian emphasis on surface decoration doesn't come to the fore for another 20 years. The cupola of the Park-McCullough Stabling, built in 1864. Here the arched vents, the double pitch of the roof, and even the weather vane are more important than the slate. The elegant tower of the N. Bennington train station. Roof on a barn in Keene, NH - I imagine that when the load of slate arrived, the roofer looked over the color variation in the lot and decided he could make the diamonds. 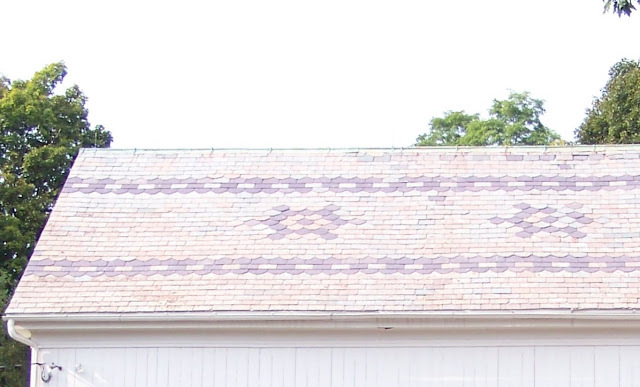 The pattern on this roof in Pownal, VT, goes all the way around. This pattern is on several houses and barns in N. Bennington. The roof of the Congregational Church in N. Bennington is visible from quite a distance. People passing by on foot or on horseback had plenty of time to enjoy it, but today we whiz past in traffic. I had to take a backstreet so that I could slow down enough to really look. Roof of Powers Market, in N. Bennington, and neighbors. Read Slate Roofs 1: Looking up.